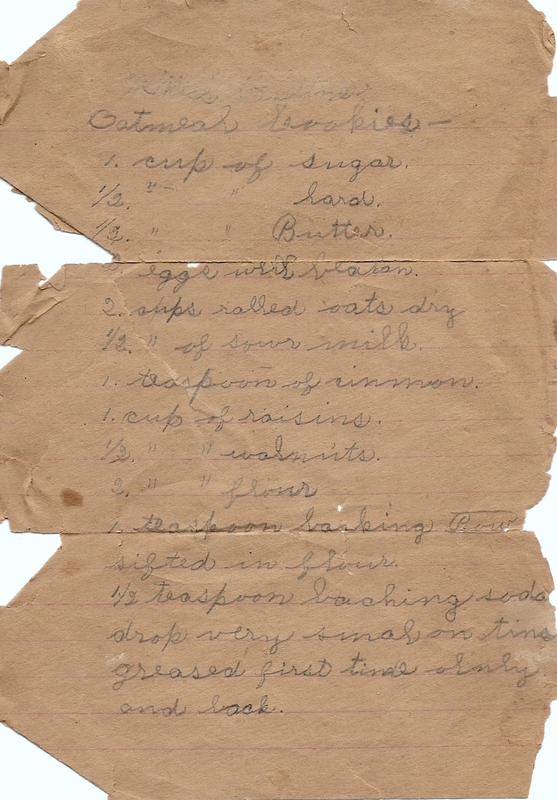 This is the original recipe for oatmeal cookies that was copied by my Aunt Helen. When I was a little girl, growing up in Detroit, my grandparents lived only a few miles away in a middle-class neighborhood typical of the city. I spent a lot of time at their house, and one of my best memories is how I always marveled at the idea that my Grandma Minnie could make cookies with the bacon drippings she always collected in a small crock on her kitchen counter. Then last fall, as I was going through boxes that have not been gone through for many years, I came across an envelope my Dad had given me that contained recipes hand-written by his sister Helen. 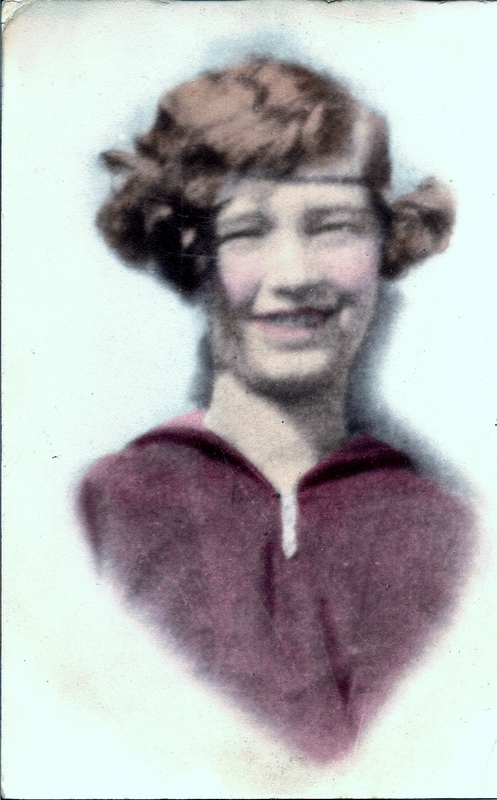 I never knew my Aunt Helen because she died at the age of twelve. But she has always been a big part of my life. I was named for her, and my grandparents talked often to me about her and how… “You are so much like her”, as Grandma used to say. One of the recipes in the envelope was for Oatmeal Cookies and one of the ingredients was lard. This instantly reminded me of those cookies Grandma used to make, so I thought I would give them a try. Jim loved the idea because he got to eat bacon every day until I had enough saved bacon drippings to make the cookies. He was not as excited about eating them! Drop very small spoonfuls on tins, greased first time only, and bake at 400 degrees for 8 to 10 minutes. The cookies on the left were made with bacon drippings, the ones on the right with vegetable shortening. 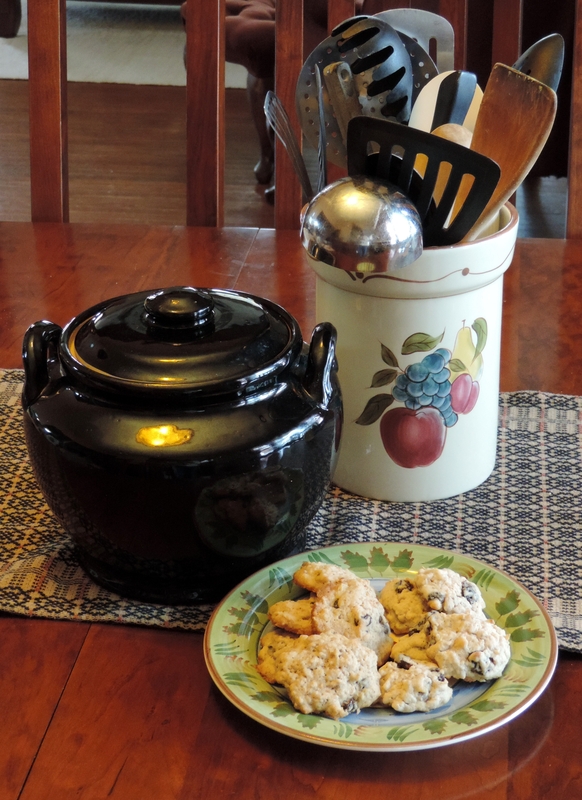 The cookie jar belonged to my Grandma Minnie, and I still love using it today. I made these cookies two ways. I made them with bacon drippings first, then made some using Crisco shortening for the lard. If you are a dough snitcher like I am, don’t make the version with the bacon drippings. The flavor is very off-putting! The cookies, however, taste pretty good. Jim actually prefers these if he is having a cup of coffee with them. The cookies made with the Crisco shortening were very good, as was the dough. The thing I like best about these cookies, either version, is that they are not so sweet. I will make them again, with the Crisco, and hope you will try them, too. Shortly after Helen died, my grandfather lost his farm in Maeystown, IL and declared bankruptcy. He, my grandmother and their three surviving sons moved to Detroit, where he found temporary employment as a night watchman for the Detroit Edison Co. He retained that position and status (temporary) until his retirement. The family purchased a home in Detroit between 7 Mile Road and 8 Mile Road, a block west of Livernois Ave. It was there that I spent so many happy days as I was growing up. Detroit, in the 1950’s and early 60’s, was a wonderful place to grow up. We walked to school from our home each day, usually taking our time, exploring the neighborhood, sometimes arriving back home later than our mother thought we ought to. There was a small store on the way that we called our “candy store”. Nothing meant more to me and my three siblings than for each of us to have a dime, or maybe even a quarter, to stop and buy candy on our way home from school. I loved buying the little colored dots on rolls of paper, and baseball cards were a big item for all four of us. We always felt safe. My mom thought nothing of allowing me to walk to the public library on Grand River, which was over a mile from our house. I would stop at my other grandmother’s apartment on my way, and she always had cookies and lemonade for me as I was “passing by”. It also gave her an opportunity to call my mother to tell her I was truly on my way home, as she watched me head in that direction, with my nose in a book instead of on the sidewalk of Greenfield Ave. When I was a teenager, our parents would let the four of us go alone on a city bus down to Tiger Stadium to see a game. I am sure they worried a little, but not like we worry today. Those days were simple, carefree, and so cherished. It is funny, although I take hundreds of pictures as we travel, I have no pictures of the city in which I grew up other than those taken at home or at the home of a relative. I have no pictures of Belle Isle, situated in the Detroit River, where we went for wonderful Sunday drives and begged to stay long enough to watch the fountain change colors after the sun went down. Nor do I have any pictures of Bob-Lo Island, a Canadian amusement park we reached on what we always called the “Bob-Lo Boat” I wish I did, and it makes me more mindful of pictures to be taken in the place I now live. Eventually my Grandma Minnie moved into our house. She was a constant presence in our lives. She helped in so many ways, always being there if our parents could not. And she continued to cook for us occasionally. She continued helping Mom and Dad can every food imaginable each summer, just as she and my Grandfather had done for years. My brother used to go to the cellar and get a quart of peaches, sit down in front of the TV and devour the whole thing in one sitting. 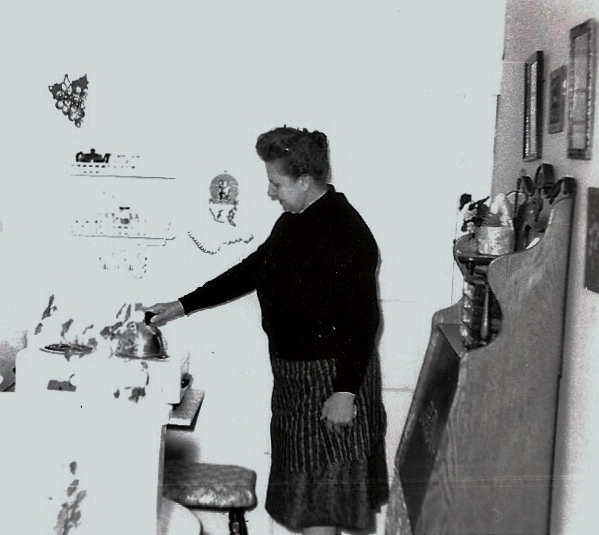 Grandma Minnie in her room at my parent’s house. Whenever I came to visit, she always had a pot of rice waiting for me. I loved that! Detroit was truly a great place to grow up, but things went terribly wrong somewhere along the way. The city thrived on its status as a blue collar city with opportunity for all its citizens. The auto industry made that possible, and, as a result, my husband and I have never bought anything other than an American-made car. Yes, we have had a few lemons, but, all in all, we have been happy with our choices. We now drive a Ford Fusion Hybrid and absolutely love it! Being the Motor Capital of the world, I suppose the city leaders thought it would be good to lead the way in automobile transportation. To serve that end, freeways were built leading out of the city. These freeways look, on a map, like spokes on a wheel. To my way of thinking, that was the beginning of the trouble. Workers could drive to their jobs each morning in the city and get on a freeway at the end of the day and quickly arrive back home. It was the beginning of the flight from the city to the suburbs, from which the city has never recovered. I love the city of Detroit and believe it has an opportunity to show the rest of America how to rebuild decaying cities across the nation. I hope so. We do not go to Detroit anymore, but our sons still follow Detroit sports and have often traveled there to see games. In the eighteenth century Bubble and Squeak was a dish made from leftover roasted meat and cabbage cooked together. It would have been served at Michigan’s Fort Michilimackinac during the time that the fort was in British hands, beginning in 1761. As time went by other vegetables were used, usually whatever was left over from a previous meal. Often mashed or smashed roasted potatoes were added as the dish cooked. It got its name because it bubbles and squeaks as it cooks. The dish is sometimes made with leftover vegetables and potatoes only, leaving out the meat. I had a nice piece of leftover sirloin tip roast and a cabbage we had picked up at the winter farmer’s market and thought it would be a good time to try this recipe. I was a little concerned because neither my husband nor I like dishes with a vinegary taste. I added the vinegar just a bit at a time and we were both surprised at how good it tasted served over mashed potatoes. It is definitely a dish we will make again! I hope you enjoy making this traditional dish as well. Boil cabbage, drain and chop into bite-size pieces. Add meat, water, and vinegar. Season to taste with salt, pepper and butter. Cook until warm. The escaping steam will “bubble and squeak” as the meal cooks. 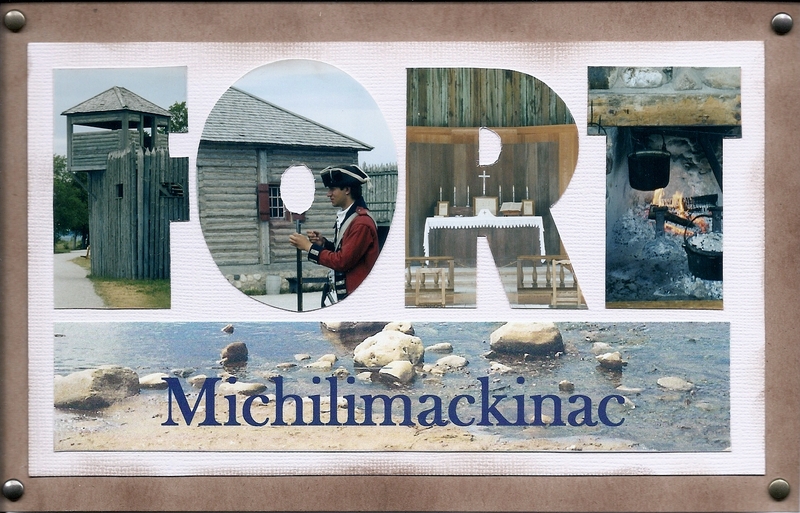 Fort Michilimackinac was established by the French in 1715 as a military fort and fur trading post. It was built on the shoreline of the Straits of Mackinac, which separate Lakes Huron and Michigan. In 1761, the fort was handed over to the British who continued to use it as both a military and fur trading post. A vibrant community flourished at Michilimackinac with many of the inhabitants being French families left from the French occupation. 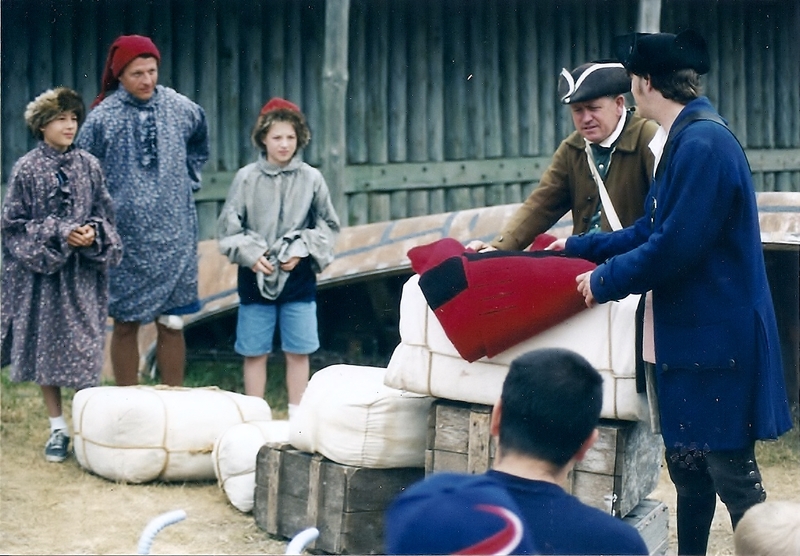 We visited Ft. Michilimackinac in 2006. Our visit was both fun and educational. 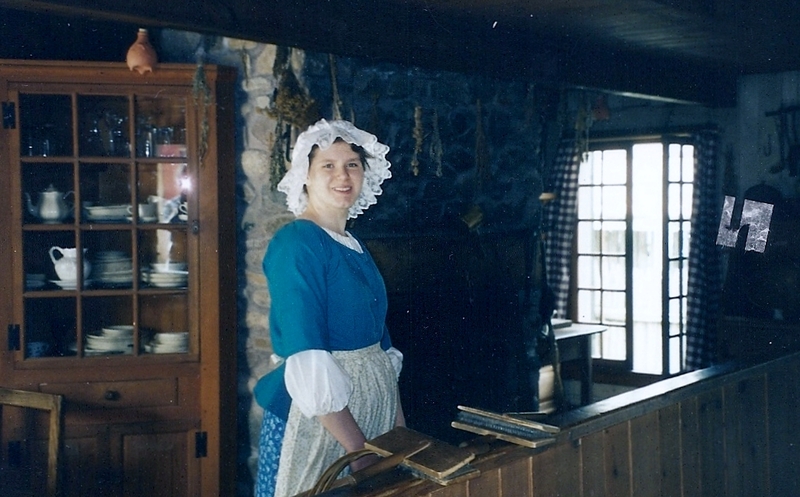 It is a living history site where interpreters “live” as the original inhabitants would have lived within the fort in the 18th century. The interpreters are also more than willing to stop and talk with visitors and answer any questions they might have. While we were there we saw voyageurs engaged in trading their furs, women carding wool and cooking over an open fireplace, a priest making his rounds in the village and soldiers on the parade ground engaged in musket drills. Fort Michilimackinac is a reconstructed fort based on years of archaeological studies and digs at the site. It is in Mackinaw City, on the Straits of Mackinac. The fort is closed in the winter and is set to reopen on May 5, 2014. It is a worthwhile visit for anyone, and especially for families. I thought starting a blog about our travels and our eating adventures would be a lot of fun. I hope to post once a week and look forward to sharing our travels and our meals with you. My next post will be the recipe for Bubble and Squeak and a little bit about our trip to Fort Michilimackinac. Jim and I love to go exploring, seeing new things, finding new places, experiencing new activities. This past summer we paddled the Missouri River at St. Charles and learned a lot about its ecological challenges, as well as getting a good workout Afterwards we ate at a popular St. Charles restaurant. It is so much fun to be retired and be free to explore! Next post: Bubble and Squeak and a trip to an old Michigan fort.